When people think about Miami, often, they think about private art collections that have historically driven the arts scene. We are trying to reshape that conversation to include the importance of an institution. Our goal is to be one of Miami’s great public institutions, dedicated to international contemporary arts, reflective of our surroundings, representing the work of the Caribbean and Latin America and a place for community conversation and dialogue. Miami is rapidly evolving right now and is home to more and more arts institutions. There is a real sense of collectivity and a relationship to art and cultural institutions. But, we are also a city that is growing in every single way. Our artists are choosing to live here. We have great programs at the preschool levels up to high school like New World and DASH. Undergraduate programs at Florida International University and the University of Miami are also doing well. There is a foundation strengthening and the conversation is evolving. One of the most important trends has been the evolution of Miami as a year-round destination for arts and culture. 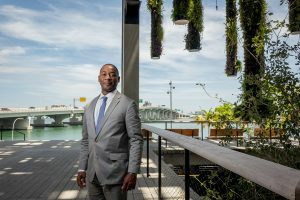 There was a time when one talked about an “arts season” but over the years an explosion in the Miami arts scene has led to Miami- Dade being a must-visit location to see important work by a variety of artists throughout the year. One example of this is PAMM’s first major exhibition focused on Jean-Michael Basquiat’s notebooks that ran from August until mid-October. The beautifully organized retrospective of this very important artist and accompanying interactive gallery was well received by visitors and journalists alike during a time that was once considered “out of season.” Miami has indeed become a global arts capital. The biggest challenge is getting people to understand a level of civic interaction that is still part of a young, growing city with people who are coming from all over the world. The biggest challenge is getting everybody to buy in on the idea of representing who we are through our institutions, as opposed to as individuals. That is what we are working on.